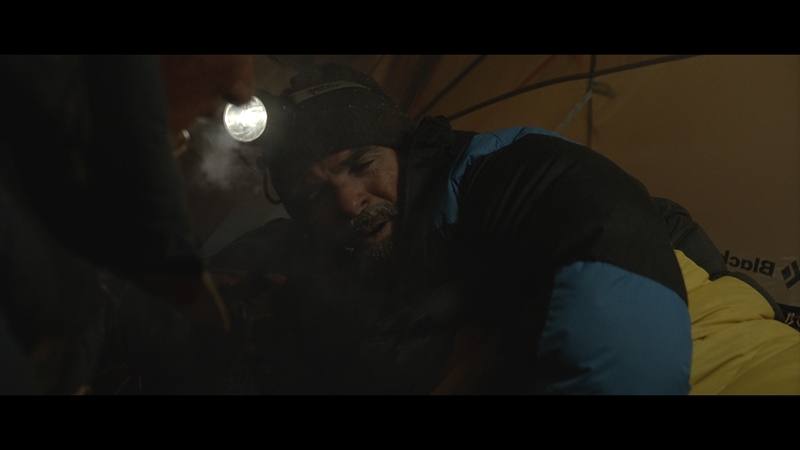 Milk created fifteen icy breath effect shots for Baltasar Kormákur’s feature film, Everest (Universal). The Milk team chose to approach the icy breath effect as a dynamic 3D task rather than using 2D elements due to the type of head movement and wind interaction. A non-deforming model was tracked to each actor’s face and used for the basis for our smoke simulations. Using this geometry we were able to create a simple “mouth box” that looked a little like an empty tissue box, and a noisy emission volume within it. This initial density was pushed forwards in sync with the actors’ exhalations and, as it collided with the walls of the “mouth” and was forced through a smaller opening, it emerged with suitable turbulence and flowing qualities. Due to the level of background noise in the audio track (wind blowing / tent flapping) we chose to key the emission of breath by hand. In fact, this ended up giving us more creative control of how and when breath was emitted and allowed us to exaggerate interesting light interactions in the occasional shot (e.g. with the head torch). Throughout the sequence we found that the greatest challenge was maintaining a fast, light look to the breath without destroying the natural turbulence patterns. There was no magical method of solving this; just careful dialing in of the simulation on a per shot basis.